“This is Pakistan’s first road-trip film and I am confident it will garner a huge audience,” said Wajahat Rauf, director and producer of the much-awaited film Karachi se Lahore, starring Shehzad Sheikh, Ayesha Omar, Yasir Hussain and Javed Sheikh, among others. He was speaking at the occasion of his debut film’s trailer launch. The film revolves around the journey of five friends, set on a road-trip to Lahore from Karachi “The concept of road movies has been adopted by Bollywood and Hollywood but it’s new to Pakistan,” Wajahat told The Express Tribune. Of the film’s plot, Rauf said it is all about friendship. “It’s a situational movie about a chaotic 36-hour journey of five friends and what can go wrong does go wrong,” he laughingly stated. Playing the lead role in Karachi Se Lahore, Shehzad said he was thrilled to have been part of the film. “It was a road-trip for us as well. We travelled around the country for 40 days and I enjoyed every bit of the shoot” he said. Of his character in the film, he shared that he plays a middle-class Karachiite, heartbroken after hearing the news of his girlfriend’s wedding. “It is quite a hyper and fun-packed character,” he remarked. “It’s a light-hearted comedy that takes you through Pakistan’s exotic locations, exploring all that has not yet been discovered in the country — all intertwined with a catchy story,” said Yasir Hussain, who plays a stammering Karachiite and has also penned the script of the film. “It’s a movie for all age groups,” he added. Popular for her stint in Bulbulay, Ayesha shared how her portrayal of Maryam in the film will diverge from that of Khoobsurat in the television sitcom. “I have been largely known for one character and breaking away from that was much-needed, which I will do through Maryam in Karachi se Lahore,” she noted. Javed expressed his pride and confidence in Wajahat’s Karachi Se Lahore, which he feels meets international standards. “I have worked in Bollywood and, when I saw that equipment and technology used in the making of Karachi Se Lahore were exactly like those used in Bollywood, I could not help but feel elated that our industry is finally booming” he said. “Karachi Se Lahore will set new standards,” he added. Playing Javed’s love-interest is Mantahaa Maqsood, a dance instructor and new entry in the entertainment industry. “It’s a small role, more like a guest appearance, but what I am most looking forward to is my performance number,” she said. Talking about her song, she said she initially came for an item number but later bagged the role of Javed’s love-interest. “It’s not an item number, it’s an itemised number.” Also playing a role in the movie is veteran actor Rashid Naz, who garnered praise for his performance in Khuda Kay Liye. “With all the political and social violence around us, Karachi Se Lahore will be a refreshing change for film-enthusiasts,” he said. The film also stars Ishita Syed, Ali Ahmad and child star Ashir Wajahat. Ali Noor, Ali Hamza and Shiraz Uppal are behind the film’s music, which comprises five exclusive soundtracks, two Bollywood-inspired songs, and a signature Noori title song ‘Dil Ki Baat’. The trailer launch was attended by notable names in the entertainment fraternity, such as Fakhir Mehmood, Saqib Malik, Waqar Zaka, Dawar Mehmood and Behroze Sabzwari. 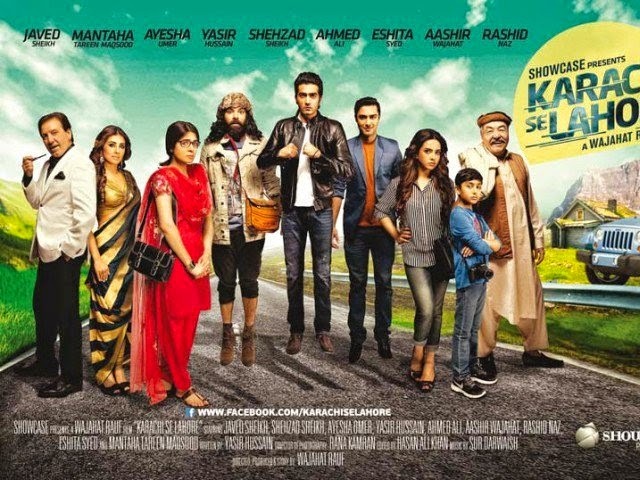 The comedy-drama Karachi se Lahore is slated to release worldwide on July 31.